By the way, the research I've been doing into offal has led me to some interesting places. This post (it's more than a month old, sorry) on Chris Consentino's blog contained several interesting links that really got me thinking about how much meat I eat and where I get it. 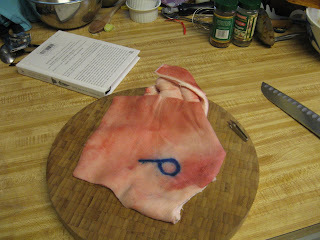 Last Thursday, I bought a 7.5 pound pork shoulder at what may be my new favorite butcher shop. I love buying big cuts of meat like this. Not only are they inexpensive (the shoulder was only $12!) but it was enough meat to feed seven people as a roast with leftovers for a pork 'n' cabbage pie tomorrow and a few lunches this week. In addition to meat, this cut also provided a large bone (for the stock pot), a small bone (for Fergus), and a large flap of skin. 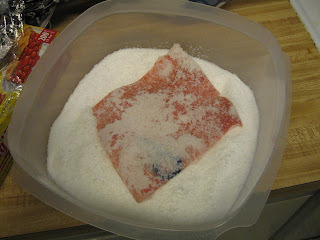 First I got out my trusty kosher salt and trimmed the skin to a workable size. Here I encountered a bit of a problem. You see, pigs are hairy animals and the hair isn't all removed in the slaughtering process. So that means that you have to shave the skin. This is one of those things that connects you to your food on a visceral level. It's really creepy, and one of those things that remind you that meat does, in fact, come from an animal. 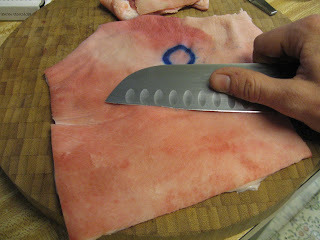 Ultimately, shaving the skin is no different from carving the roast. Just pack the skin in salt. 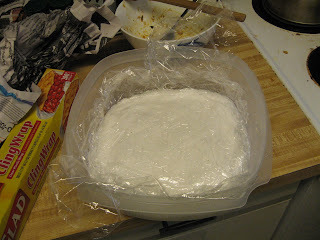 Then cover in plastic wrap. Now it's curing in the fridge. Check back in a few days for the rest!